THIS ORDER FORM IS FOR DOMESTIC SALES WITHIN THE UNITED STATES ONLY. IF YOU'RE FROM ANOTHER COUNTRY, PLEASE RETURN TO THE ORIGINAL WEBSITE PAGE AND REFER TO THE INSIDER'S GUIDE MARKED INTERNATIONAL SALES. 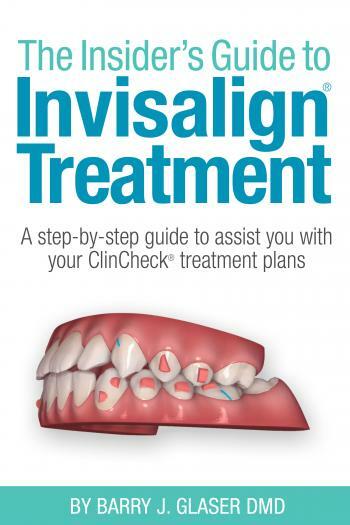 Do you really know what to look for in your Invisalign® treatment plans? After reading this book, you will never look at a ClinCheck® plan the same! Unleash the power of virtual treatment planning using the ClinCheck® software by using Dr. Glaser’s revolutionary methods to retrain your eyes and mind to look at your ClinCheck® treatment plans in an entirely new way -- as force systems, not teeth.